There's been some rather full-on marine construction work happening on the Brisbane River at Bulimba River Park. A few weeks ago a barge toting workmen's huts and a huge floating crane anchored just off the bank. 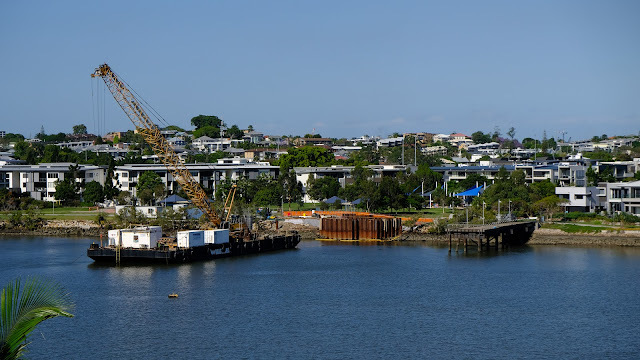 Immediately I started to wonder what was happening - a new ferry pontoon, another marina, a new service point for city cats; perhaps even a kiosk or bandstand for Bulimba River park? In today's photo, below, you can see the barge that floats the crane and huts on the left, an unknown structure in the middle and a jetty on the right that has been there for years. The structure in the middle consists of many vertical piles that have been driven into the river bed in very close formation. What on earth could they be for? 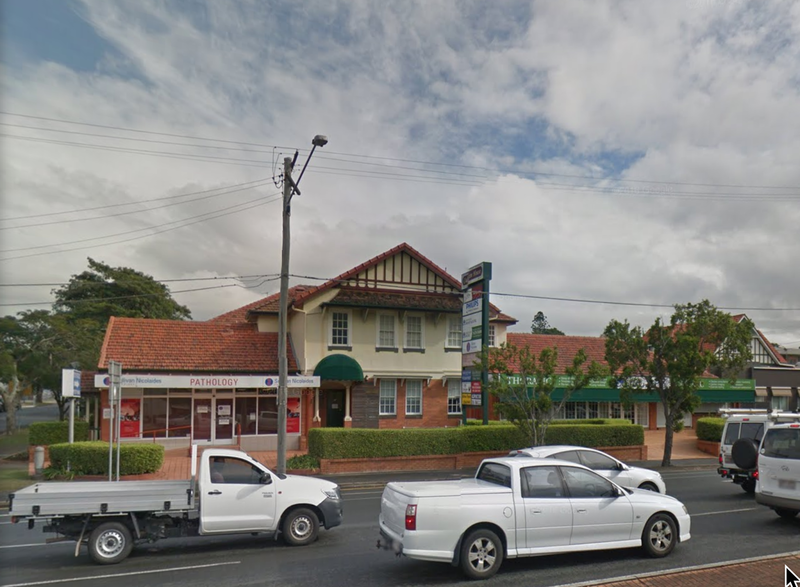 Weary of trying to guess what might be happening here, I half-heartedly Googled "construction river bulimba" and voila - in an instant I was looking at the answer to my search. 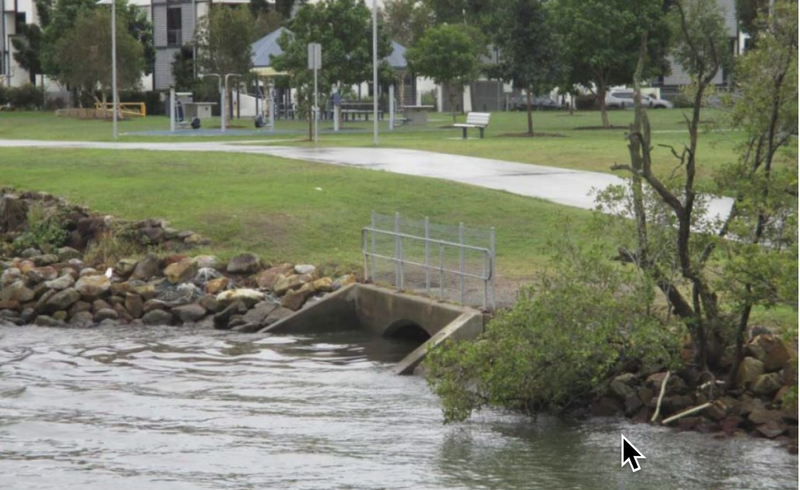 The third entry on the Google page said "Backflow Prevention Device - Bulimba Riverside Park". Most Brisbane residents could remember the city experiencing a flood or two. The really damaging recent (recent=in my lifetime!) ones occurred in 2010-1 and 1974; and the grandfather of them all was in 1893. For the first time, in 2010-1, I heard the phrase backflow. 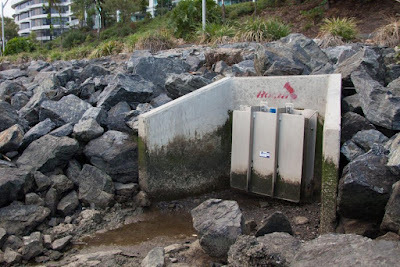 Backflow of the city's stormwater drains occurred during that flood, and indeed may have been the cause or at least compounded property damage in some low-lying areas of Brisbane. Stormwater drains are designed to carry surface water away from roads and buildings to the river. The following diagram shows how, when water levels of the river rise above the level of the drains, the reverse can happen - water flows from the now-higher river back through the stormwater drains which then overflow and compound the flooding that is occurring as a result of the falling rain. Here is a photograph of what used to be seen on the river bank where those piles are now located. 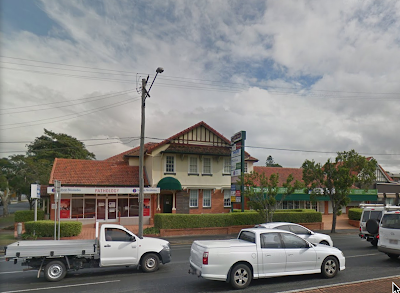 Should you wish to read a comprehensive discussion about Brisbane's backwater, I recommend the marvellous pages at Angus Veitch's There once was a creek blog. It will be interesting to photograph the new valves after construction - I will post that here. This is one that has been installed at Milton. One of the issues many of us face as we grow older is the increasing number of medical appointments. 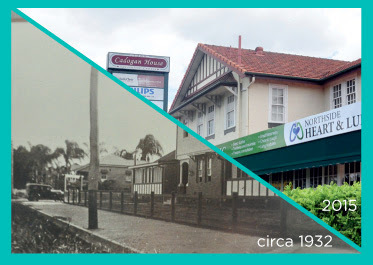 It's in this capacity that I had my first-ever visit to Cadogan House at Nundah, a marvellous mock-Tudor style structure on Sandgate Rd that is the site of a number of medical suites. The name sounded vaguely Scottish to me and I thought (incorrectly as it turns out) that it may have been named after one of the various Earls of Cadogan. The current Earl Cadogan happens to be one of the wealthiest men in Britain, having huge real estate assets including owning a large proportion of London. Surely It wouldn't have been impossible for one of his wealthy forebears to have purchased real estate in the Antipodes? No, the answer is a far more practical solution than that. The building was constructed during 1933 as the Nundah Private Hospital. The BCC heritage pages tell us that it was owned by three nurses - Misses Barclay, Bourne and Bell. The hospital originally had facilities for 30 patients together with accommodation for staff, but was subsequently enlarged in 1937.